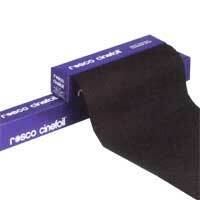 Matte Black Cinefoil By Rosco. A matte black aluminum material that virtually soaks up light. Ideal for masking light leaks and/or eliminating unwanted reflections. It can be quickly molded to form barndoors, flags and other configurations. Lightweight, yet durable, Cinefoil can be quickly positioned in place with tape, staples or adhesive. Packaged in a handy dispenser box.